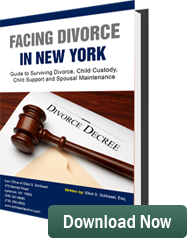 The courts in New York only exercise jurisdiction in divorce cases where a minimum of one party resides in the State of New York. New York has very specific residency requirements set forth in New York Domestic Relations Law section 170 (DRL 170). When parties seek to end their marriage, they often find the legal process to be stressful, slow and more complicated then they imagined. Issues concerning the division of assets, child custody, child support, spousal maintenance (alimony) and visitation can be both complicated and stressful. An experienced divorce lawyer can simplify the process and help deal with the aggravation and frustration that is often caused by the dissolution of a marriage. Marital property is property accumulated by the parties during the course of a marriage. Separate property is property accumulated by one spouse prior to the marriage. In addition, assets inherited or received from personal injury awards, maintained in the name of one spouse obtained before the marriage or during the marriage, are also considered separate property. Marital property is subject to equitable distribution. Separate property is not. Marital property may also include real estate, corporations, business interests and professional licenses obtained by doctors, lawyers, architects and others.